Prince John: Enough! Hiss, you deliberately dodged. Sir Hiss: But... Sire, please. Prince John: Stop sniveling and hold still. Sir Hiss: Thank you, sire. Little John: Hey, old Rob's not a bad actor. But wait till he sees this scene I lay on Prince John. Ah! Me lord. My esteemed royal sovereign of the realm. The head man himself. Prince John: You're beautiful. He has style, eh, Hiss? Little John: You took the words right out of my mouth, PJ. Prince John: "PJ"! I like that. Do you know I do? Hiss, put it on my luggage. Prince John: Hiss, with you around, who needs a court jester? Now get out there and keep your snake eyes open for you know who. Sir Hiss: You... You mean, I... I'm being dismissed? Little John: You heard His Mightiness. Move it, creepy. Get lost. Begone, long one. 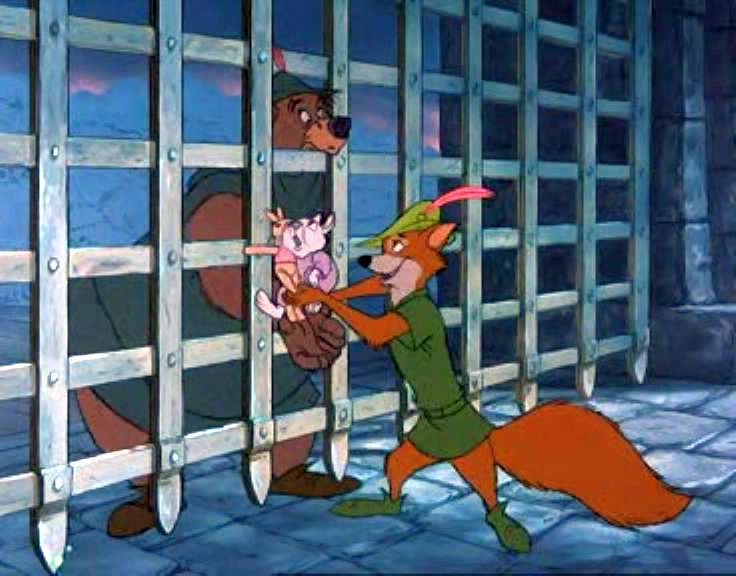 Robin Hood: Oh, thank you kindly, Your Highness. Meetin' you face-to-face, Your High and Mighty, is a real treat. Sheriff of Nottingham: How about that? Sheriff of Nottingham: But, sire, it's a big hit. The whole village is singin' it. Prince John: Oh, they are, are they? Well, they'll be singing a different tune. Double the taxes! Triple the taxes! Squeeze every last drop out of those insolent, musical peasants. Friar Tuck: Yes, those poor people. Look, our poor box is like our church... empty. Sheriff of Nottingham: Now, take it easy, Friar. I'm just doin' my duty. Friar Tuck: Collectin' taxes for that arrogant, greedy, ruthless, no-good Prince John? Sheriff of Nottingham: Listen, Friar, you're mighty preachy, and you're gonna preach your neck right into a hangman's noose. Sheriff of Nottingham: Oh, Nutsy, that's mighty sweet. Sing it one more time, would you? Skippy: I'm ready. Where's the bad guys? Friar Tuck: Take it easy, son. 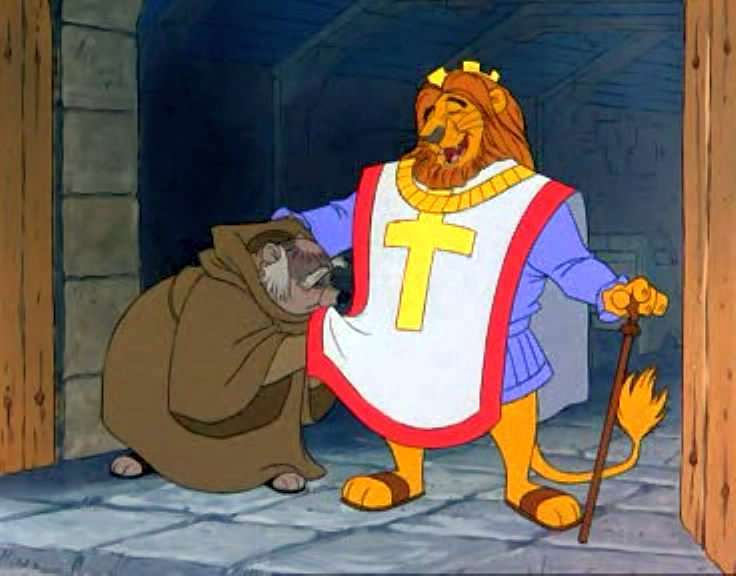 Friar Tuck: Praise the Lord and pass the tax rebate! 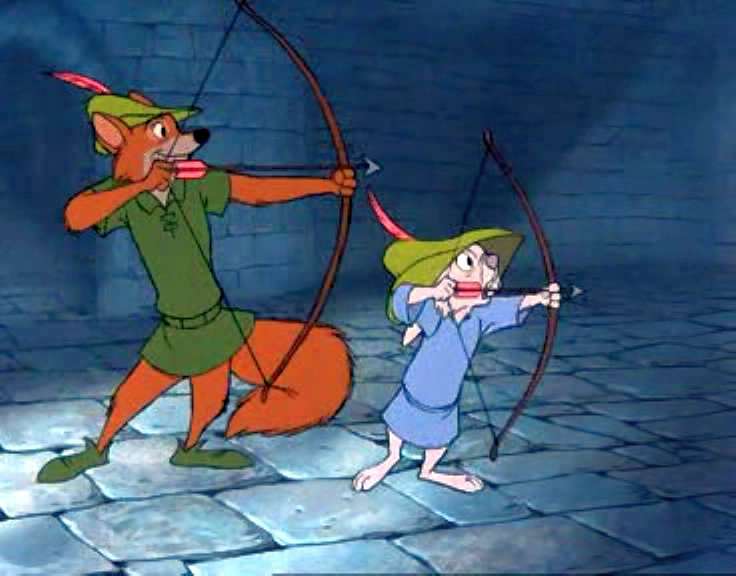 Robin Hood: A pox on that phony King of England! Oo-de-lally! Oo-de-lally! Prince John: Oh, no. It's so miserably unfair. Trigger: Now, sheriff... Now, don't get your dander up, but I still got a feelin' that... Little John: Friar, get goin'. Hurry. Prince John: Guards! Guards! My gold! Oh, no, no, no. They're getting away with my gold. Guards! Guards! To the jail! Rhinos, halt! Stop! Desist! Robin Hood: Everybody, this way! That's all of them. Get going. Little John: This ain't no hayride. Let's move it out of here. Friar Tuck: On to Sherwood Forest! Mother Rabbit: Stop! My baby! Tagalong: Mama, Mama, wait for me. Sheriff of Nottingham: We got him now! Robin Hood: Keep going. Don't worry about me. Sheriff of Nottingham: This time, we got him for sure. Prince John: Shoot him! Kill him! Little John: Come on, Rob. Come on. Skippy: He's just gotta make it. Little John: No! No. No. Prince John: Hiss, he's finished! Done for! Skippy: He's gonna make it, isn't he, Little John? Skippy: Hey, what's that? Little John, look it! Look it! Little John: Hey, what the... Oh, man, did you have me worried, Rob. Robin Hood: I thought you were long gone. Skippy: Ah, not Robin Hood. He could've swum twice that far, huh, Mr. Robin Hood, sir? Sir Hiss: Look, sire! Look! He's made it. He got away again. Robin Hood: A pox on that phony King of England! Oo-de-lally! Oo-de-lally! Prince John: Oh, no. It's so miserably unfair. Sir Hiss: Well, I tried to tell you, but, no, no, no, you wouldn't listen. Your traps just never work. And now look what you've done to your mother's castle. Prince John: Mommy! Sir Hiss: Sire, no! Prince John: You cowardly cobra! Sir Hiss: Please! Oh, no! Prince John: Procrastinating python! Aggravating asp! Sir Hiss: Save me! Prince John: You eel in snake's clothing! Sir Hiss: Help! He's gone stark raving mad! Alan-a-Dale: You know, I thought we'd never get rid of those two rascals, but lucky for us folks, King Richard returned, and, well, he just straightened everything out. We'd better get over to the church. Sounds like somebody's gettin' hitched. All: Long live Robin Hood! Long live King Richard! King Richard: Oh, Friar Tuck, it appears that I now have an outlaw for an in-law. Yes, not bad. Toby: Gee, Skippy, how come you're goin'? 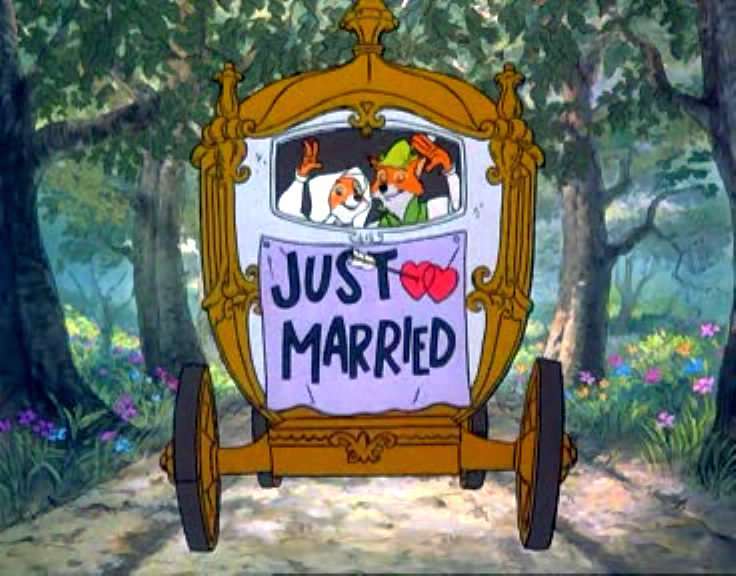 Skippy: Well, Robin Hood's gonna have kids, so somebody's gotta keep their eye on things. Little John: Ho-ohh! Lady Cluck: Oh, I've never been so happy. Nutsy: Hey, here come the bride, Trigger. Present arms! Alan-a-Dale: Well, folks, that's the way it really happened. Love goes on and on / Oo-de-lally, oo-de-lally / Golly, what a day / Oo-de-lally, oo-de-lally / Golly, what a day!